Yorkshire-based Platinum Stairlifts was backed by private equity firm NorthEdge Capital back in February 2018. Since then, the company has experienced a tremendous amount of growth, a management reshuffle and heavily invested into product research and development. THIIS caught up with Danny Greenwood, Marketing Executive at Platinum Stairlifts, to find out more about the company’s progression, the importance of its dealer network and future challenges. With the launch of its new Ultimate Stairlift, which was unveiled at the OT Show, Platinum focuses a lot of its attention into creating custom-made products. Talking about the benefits of having a tailor-made stairlift, Danny explained end that this ensures the product is a perfect fit for a person’s staircase, regardless of the environment it is being installed into. The marketing executive also said that the Ultimate’s custom build is simple to put together and install, making it easy for dealers who no longer have to worry about complicated staircases or products. Ensuring a perfect fit, the company says the Ultimate will also look to benefit its global dealers’ network, where the home environments the stairlifts are being installed into differ from that of the domestic market. “In Holland, there are a lot of steep, narrow staircases, for example. Whereas in France, there are a lot of barn conversions and downstairs basements and historical builders never considered the need for a stairlift. With 70 percent of the organisation’s business consisting of export, the need to create a product that can cater for overseas markets is all the more important for the Yorkshire manufacturer. With a substantial proportion of Platinum’s business focused on export, the growing demand of the stairlift market is one that is not just domestic but global. Largely due to the ageing population, the Office for National Statistics reporting in 2016 that the number of over 65s is expected to grow by 20 percent by 2026 in England alone. With this forecasted demographic shift comes an increase in the number of people with mobility issues, subsequently causing a higher demand for mobility aids. The global stairlift market is estimated to be worth £1 billion and growing, a trend not missed by private equity firm NorthEdge Capital. After receiving the private equity investment backing in February, Platinum also experienced a management reshuffle within the company. “Before, we were growing at such a rate that we were just trying to tie things over,” Danny explained. The restructure has also allowed Platinum to become more efficient, cut lead times down and look into the quality of its products claims Danny, as well invest more time and money into researching and developing new products. Commenting on the overall aim, Danny said: “We want to be at the forefront of stairlift design and push the boundaries of what a stairlift can do. Every product we’ve created has made an impact in some way. Following the recent financial backing, Platinum has invested in its manufacturing capabilities, with a key focus on improving productivity. “In the past, manufacturing hasn’t been able to keep up with demand. So, we heavily invested in our productivity and that has been reflected in our sales as they have increased,” emphasised Danny. In addition to the development of new stairlift products, the marketing executive stressed that Platinum also researches how to improve the installation process relating to products for dealers and engineers, something Danny says sets the company apart from its competitors. It is an often-discussed topic about the difficulty of selling mobility and independent living products to customers, with many stigmatising stairlifts as the embodiment of being elderly and less mobile. 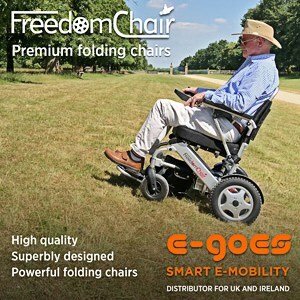 A recent report by The Centre for Ageing Better highlighted that these stigmas are playing a key role in preventing people from buying mobility equipment until they are in desperate need, rather than future-proofing their homes to ensure they are accessible before their situation deteriorates. It is this problem around product perception that Danny says Platinum is keen to tackle, by developing more attractive products and, importantly, changing the conversation in relation to mobility aids. “We aim to make our stairlifts look attractive and giving the end-users more choice in the type of stairlift they can get,” he explained. “I think there’s been a lack of thought into the visual design of stairlifts and mobility aids. Despite stigmas still being prevalent in the market, Danny suggests people are slowly starting to accept the idea of mobility products becoming a natural part of the ageing process, citing the company’s growing sales and demand as key indicator of changing consumer tastes. An area that often divides opinion, particularly in the stairlift market, is the decision for some manufacturers to sell direct to end-users, with arguments for and against. On one one hand, going direct to consumers can reduce prices for end-users, with manufacturers benefitting from increased margins and complete control over the sales and installation process, forgoing working through a dealer network. Conversely, utilising a dealer network can provide a lot more coverage and reach, as well as having a local element which is often key for providing customer service and quick aftersales support. When asked about Platinum Stairlifts selling direct to end users, Danny insisted: “We won’t. We absolutely will not. “We sell solely through our dealer channel and that is sacrosanct to us. Our niche in the marketplace is doing what we say we’re going to do, which is support our dealers. He added that he feels some companies within the stairlift sector get enticed by margin opportunities by selling direct to consumers. However, he said that Platinum will not be tempted by this approach, rather staying true to the business model that has garnered the stairlift company so much growth. “The direction, shape and scale of the business would completely change if we were to go direct to the end user. Being brutally honest, we haven’t got the skill set to do that, let alone the desire,” he added. According to Danny, the key advantage of working with a dealer network is it frees up the company to focus more on its products. “It gives us a chance to focus on manufacturing and developing new products, rather than worrying about end-users,” Danny explained. A key element of Platinum’s dealer network structure relates to exclusivity, providing select dealers exclusive reign in certain areas of the country to ensure an area does not become oversaturated. “We don’t want to tarnish the relationships with our dealers, we want to make sure that they grow and then, in turn, we get more stairlift sales from that growth,” emphasised Danny. “So rather than getting a few in York, we’ve got one exclusive dealer for the York area, so nobody else can sell our product there. The company now says it is reviewing which areas need more coverage and expand its dealer network in the future, continuing to offer certain retailers exclusivity. In addition to exclusivity, Danny highlighted that providing support to the dealer network is a priority for the company and for him particularly. “For me, it’s the number one thing that I want,” Danny said. To provide support for the retailers, Platinum runs extensive training of its range of products. He added that the company can also assist its dealers with stairlift installations until they thoroughly understand the process. “We don’t let them do it on their own until they’re happy and comfortable,” he commented. Alongside utilising a dealer network, Platinum Stairlifts also emphasises the importance of working with occupational therapists. Danny said: “Occupational therapists are industry influencers, so building relationships with them can help us develop better products, which adds a certain level of trustworthiness to our stairlifts. As well as attending industry exhibitions, it is important that manufacturers do a number of other initiatives to promote their products to customers. For Platinum, it undertakes a range of different methods to showcase its stairlifts to a wider audience. Although obtaining case studies is easy in the UK, Danny noted that this is more difficult for the company’s export countries as they require translation, however, it is an area that the company is planning to develop further. As well as case studies and online videos, Dany says the company is also working with its dealers on showroom merchandising, providing a space in showrooms for customers to try Platinum products out, along with professional brochures and marketing materials. One of the challenges facing Platinum is the consolidation of its manufacturing all under one roof, with its production currently spread across multiple sites. “At the moment, the buildings that we have for manufacturing are separate because as the business has grown, we’ve had to take units when we can,” Danny commented. Additionally, with rapid growth comes a challenge to balance to manage demand, both from end-users and its dealer network, continued Danny. As for the future of the company, Danny concluded: “I’m massively confident in the success we’ll have as a business in the future and our dealer partners will have. All I can see for us is opportunity.